Manchester, N.H. - The Eastern League of Professional Baseball has announced the selections for the 2016 Full Season Eastern League All-Star Team, as voted on by Eastern League managers, coaches and media personnel. 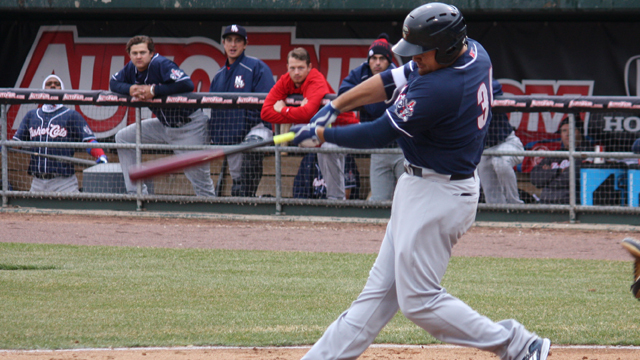 Fisher Cats 1B Rowdy Tellez is one of 13 players to be named to the All-Star roster. The All-Star squad consists of one spot for each position on the field, including a designated hitter, utility player, right-handed starting pitcher, left-handed starting pitcher, and relief pitcher. Tellez was voted in at the DH spot. The 21-year-old from Elk Grove, Calif. is hitting .300 with 27 doubles, two triples, 18 home runs, 72 RBIs and 63 runs scored in his first Double-A season. Tellez is currently ranked among the league leaders in on-base percentage (.384 - 2nd), slugging percentage (.501 - 3rd), OPS (.899 - 3rd), home runs (18 - 5th), walks (58 - tied 5th), total bases (203 - 6th), extra-base hits (47 - tied 6th), RBIs (72 - tied 7th), runs scored (63 - tied 8th), batting average (.300 - 9th) and doubles (27 - tied 9th). Tellez, who is rated by MLB.com as the ninth best prospect in the Toronto organization, was a member of the Eastern Division roster for the 2016 Eastern League All-Star Game in Akron, Ohio. He's continued his impressive hitting through 24 games in August, batting .348 with five home runs and 20 RBIs this month. The Blue Jays selected Tellez in the 30th round of the 2013 draft out of Elk Grove High School.